Normally, Dominant Rally Man Stays With Winning Team wouldn’t be much of a story, but when that team is the only non-manufacturer squad in the World Rally Championship, it’s an off-season miracle. 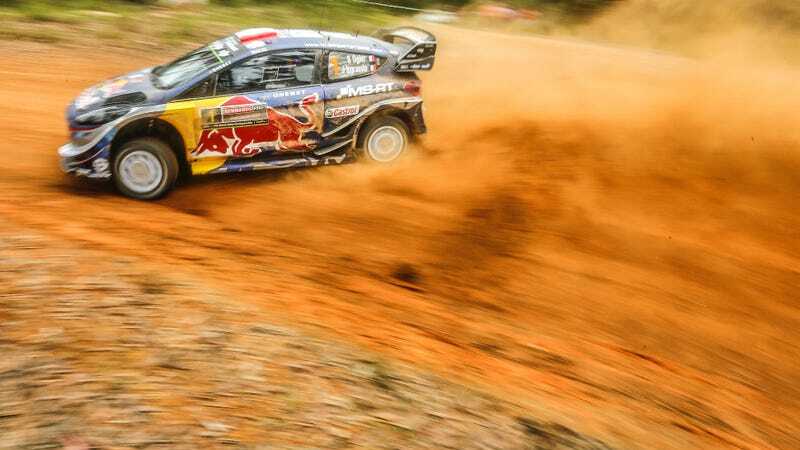 Lovable rally underdogs M-Sport announced today that five-time WRC champ Sébastien Ogier and his codriver Julien Ingrassia will keep driving with the team for next year. M-Sport’s future looked iffy for a while after they lost Ott Tänak to Toyota for 2018 and Ogier started openly talking about retiring. They won the teams’ championship for this year, but still didn’t have news on their 2018 plans. Team owner Malcolm Wilson was racing’s least optimistic man whenever he spoke about that, too. However, the WRC reports that M-Sport was able to find the extra budget to match what Ogier wanted from the team. Ogier rejected an offer from Citroën to stay with M-Sport. While the WRC didn’t delve into budget details in their announcement of the deal, there’s a good chance that M-Sport will be less of an underdog next year, with a budget closer to the big manufacturer teams of Toyota, Citroën and Hyundai. WRC commentator Colin Clark says Ford Performance stepped in with the extra cash to meet what Ogier wanted out of the team next year after all. Clark says Ford is “properly back in rallying,” as Ford’s last true manufacturer entry in the WRC was in 2012. We’ve reached out to Ford for clarification as to what that could mean exactly, but it does at least sound like someone at Ford may have heard our rant on the matter. Driver Elfyn Evans, who won his first WRC rally in Wales this year, will also continue to drive for the team. M-Sport will also have a third car, but no drivers have been announced for it yet. UPDATE [7:05 p.m.]: A Ford representative declined to speculate on plans for next year beyond being “delighted that M-Sport will return in 2018 with Sebastien in the championship-winning Ford Fiesta WRC.” However, Colin Clark elaborated a bit more on the Ford deal from his kitchen table, where he explained that it’s now Ford Performance—the worldwide entity—backing the M-Sport team next year, not just Ford’s European arm offering support as it has been.